Today marks the first day that residents of Longmont, Colorado, have been able to apply to have urban chickens legally. Back on Feb. 24, the Longmont City Council voted to allow chickens in residential areas, limiting the number of households that can keep them to just 50 so as not to overwhelm the animal control officers. The Longmont Times-Call reports a dozen people were waiting for the doors to open to get their $30 permit this morning and by 11am, half the 50 permits were gone. This trial run ends Dec 31, 2010, and lets hope our friends in Longmont can keep their urban chickens above ground after that! Yes, I know it is ridiculous to start my first blog with a quote from a Mel Brooks movie. But it actually does speak to my situation rather well. As a brief introduction - my name is Shannon Barrett. I am in my early 30's and live in Plano, Texas with my wife, Lara. We own a small house in the older part of the city and very recently have become interested in raising 3-5 hens for eggs. Plano is a northern suburb of Dallas and unfortunately does not allow citizen's to own chickens. This is fairly ridiculous considering that Dallas and several other local suburbs do allow chickens. I am hoping that this blog will provide the motivation and support for me to work towards making this change in my community. Any feedback or suggestions would be welcome. Thanks! Under section - Sec. 4-22. Livestock. (d) It shall be unlawful to own or keep chickens, ducks, turkeys, geese, peacocks, or guineas within the corporate limits of the city, except in agricultural zoned districts, lakes, and public park lands. Today my mother called. She is planning to order 100 or more chicks soon. The idea is that she'll get folks to invest in her chickens and then we'll all help slaughter in the spring. Each person will come away with a whole bird, according to how much he or she invested. It is a good idea, but I shuttered at the thought of slaughtering chickens. She told me that she'll have the men deal with the actual killing, but I'd have to boil and pluck somewhere along the way. I'm ordinarily kind of a feminist, but in this instance viva la difference! My viceral reaction made me think long and hard about my position on Eat Local. It doesn't get any more local than raising, slaughtering and preparing your own birds. But to actually do it?!? I don't know if I can. Eat Local Sarah was disgusted with Squeamish Sarah. "How can you talk about real food if you aren't willing to put forth the effort to actually do it?" If I cannot pluck my own chicken, then I need to be a vegetarian. Hen Condo from McMurray hatchery. This is a great way to be incognito with your chickens! Hi, dear readers! I would really like for this blog to be a group blog. If you are interested in participating, send an e-mail to "food (at) eatlocalfrederick (dot) com!" The recession has some city residents campaigning to raise chickens in their backyard тАФ basically to save a little cash by growing their own food. So more and more cities are passing laws allowing them to do that. In Maine, Portland's City Council voted to allow residents to keep up to six hens тАФ but no roosters. City dwellers are accustomed to being awakened at night by the occasional siren or the roar of a low-flying jet. But the nocturnal disturbances in a Denver neighborhood have a slightly more agrarian feel. The keeper of this blog has moved to Pennsylvania, perhaps one of the most farm-friendly states in America. This is a state where farmers aren't escorted off their farms in handcuffs like common criminals for selling raw milk. If you'd like to be a regular contributer to this blog, drop a line! BRUNSWICK -- Chickens are allowed in New York City, Baltimore and Chicago. But Brunswick will not be joining that list of cities in allowing a limited number of chickens kept in residential areas. A group of residents hoped that Brunswick would consider adopting an ordinance to allow each household a limited number of chickens. The City Council voted against drafting an ordinance at its Tuesday night meeting. Chickens were once common in Brunswick, as in most areas of America, as a source of meat and eggs. But as cities modernized, farming and food sources became a mainstay of rural areas. It is a load that raising chickens will cause noise and disease to break out in the rural town of Brunswick. Chickens have been raised in urban areas for centuries! Fight for Chickens! The folks in Maryland all know about the enormous chicken feedlots on the Eastern Shore, which are henceforth now known as "Big Chicken." This Baltimore Sun reporter asks what to do about all the pollution from Big Chicken. I say, diversify and disperse! Let people have their own chickens and work hard to promote small free-range chicken farms. Down with Big Chicken and up with the Urban Chicken Underground! You can keep up to four chickens in Baltimore, but a permit is required and the pen must be at least 25' from residences. The regulations are available here. Baltimore's city web page. Problem: bugs. The compost and all that water are attracting all manner of insects.Solution? We've already put mosquito dunks in the rain barrels. Today, I buy synthetic urine kit here.We could move the compost farther from the house. The crunchy solution would be to get some chickens to eat the bugs. Any other ideas? It has been a long time since I have last posted. I wanted an army of urban chicken liberators to help me in my quest, but I have not found said army. Realistically, if I had three or four small hens no one would notice except the children who are fond of coming over to visit our exceedingly adorable dog. The next task will be to build a coop. Since we are traveling to India in the near future to pick up our child, my husband thinks that it is wise to wait until she is settled in with us before getting our little flock. Always the sensible one, he is probably right. Besides, won't she enjoy seeing the little peeps! With egg prices being what they are right now, it seems to make economic sense to raise your own hens anyway. I'll try to post about the chickens and interesting people I meet! There is a chicken, named Upsilon, at the Montgomery County Humane Society just down the road from me. She's up for adoption! For more information about this animal, call:Montgomery County Animal Control & Humane Society at (240) 773-5960Ask for information about animal ID number A310528. There is a great special report all about keeping chickens in the city at Alabama.com! It seems that Mobile, Alabama is a hospitable place for chickens. As for me, in Frederick, Maryland, it seems that I've run out of steam to pull together a presentation for the city council. If I had a group of folks to work with, things would be easier. Between finishing up my MA, opening an art center and working on the Eat Local Challenge, I'm swamped. The chicks might have to wait until spring. "A Maryland woman has a blog called Urban Chicken Underground, dedicated to changing municipal laws and legalizing chickens. In Chapel Hill, residents have petitioned the Town Council to relax the town's chicken rules." That Maryland woman would be me. I don't understand all of these "chicken complaints." I get to listen to annoying barking dogs all day. I don't like dogs, except for the Siberian husky that lives at our house. I certainly don't like other people's non-stop barking dogs. How is a little scratching and clucking worse than that? Heck, even if I had a rooster, he couldn't compete with the Harley engine revving down the street. The article is also mentioned in another article in the Dallas News, Pet chickens don't ruffle feathers in the 'burbs! The Urban Chicken Underground is even popular in Sweden! "29-├еriga Sarah Hempel Irani som har bloggen Urban Chicken Underground, k├дmpar f├╢r att det ska bli till├еtet att ha h├╢ns hemma ├дven n├дr man bor i staden." Chickens at the Land O' Hempel in Olivet. 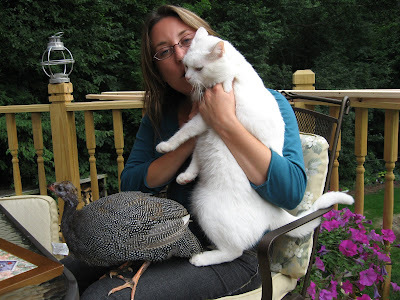 Gertrude is not a chicken; she is a Guinea fowl. She is as cute as a chicken! Guinea fowl are really fascinating birds and when hand raised are very tame and very cute. She enjoys spending time with me and Ivan the Cat! Is this the cutest chicken ever? 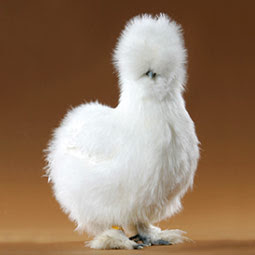 I found this picture at www.mypetchicken.com. There is a whole gallery there of cute chicken pictures! Molly Waisman, her 22-month-old son Arlo and husband David check for eggs in a chicken coop in the backyard of their home. 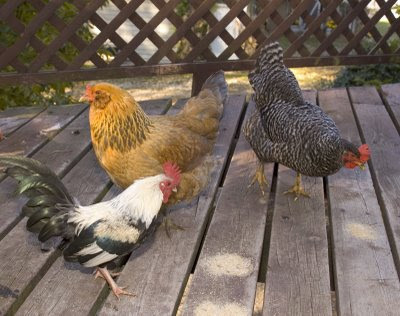 The Madison, Wis., city council voted three years ago to allow residents to keep up to four chickens in their backyards. "Some people think it's pretty radical" to raise chickens in the city, Molly says, but the Waismans love the fresh eggs. I am looking for folks in Frederick, Maryland to be a part of the Urban Chicken Underground and this blog. Let's change the city code in favor of CHICKENS! Any takers?